Now that I have a functioning IPv6 network, I can actually “see” how much of the public Internet (or at least web sites) are IPv6. Before I had the home net on IPv6, I was limited to just using DNS queries for AAAA records (over IPv4). My new favorite FireFox plug-in is IPvFox, which gives me IPv6/IPv4 information right in the URL “awesome bar”. I can tell at a glance, if the current page’s data was served over IPv6, IPv4 or mixed. Here are a few images showing which sites/pages are loaded via IPv6, IPv4, or both. This first one is interesting, ipv6.google.com. As you can see from the image, the main page (URL) is IPv6 (big green “6”), but other parts of the page loaded via IPv4 (little red “4”). Clicking on the 6/4 image in the URL bar shows you which parts loaded which way. The main URL is IPv6, but the other parts of the page loaded over IPv4. 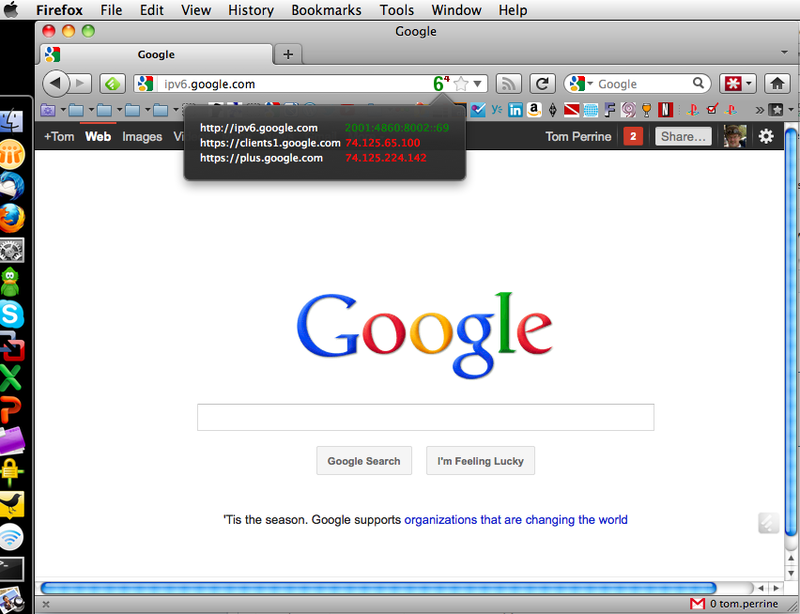 Note that plus.google.com loads over IPv4. This next one is ipv6-test.com. Again the main page loads via IPv6, but the other content on the page is loaded from a combination of other sites running IPv4 and IPv6. Here’s another IPv6 test site, test-ipv6.com. This one uses IPv4 for the main site, and then pulls elements over IPv6 and IPv4. 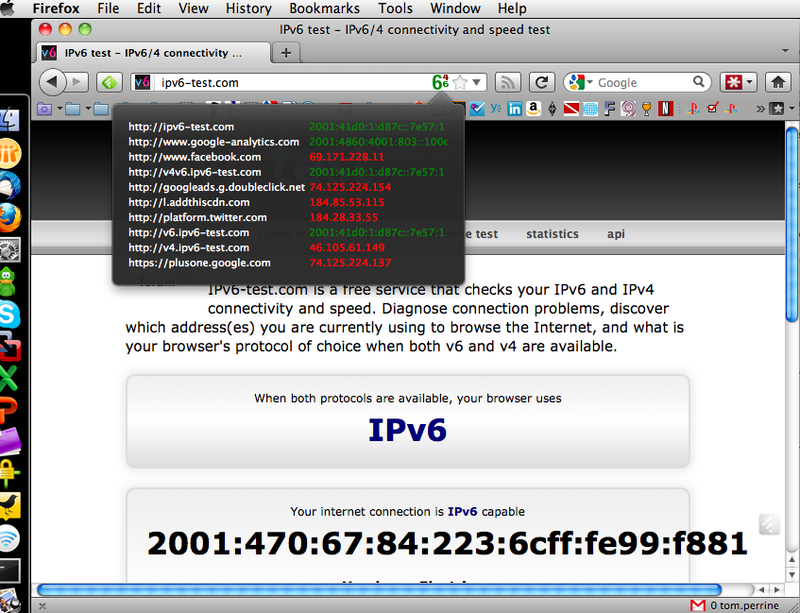 As I do my daily browsing, it’s interesting which sites come up over IPv6, and which don’t. I’m seeing more media and social sites on IPv6, and very few vendor sites. I had expected to see much more IPv6 from the big network kit vendors, but they are noticeably missing. Some of them “do” IPv6 on a separate host (ipv6.google.com, for example). Not surprisingly, the main DREN web site is 100% IPv6. Cisco, Juniper, IBM, Apple and Dell are all 100% IPv4. Many Mozilla sites, and a few US Government sites (Department of Education), and even Fark! are all solidly IPv6. I wonder if the social media sites will lead the charge, or the vendors? Right now, I’m not seeing a lot of commitment from companies that I would hope have a lot more IPv6 experience. They are going to want my company’s money for new network gear in the coming year, and I’m going to be asking hard questions about why they don’t have their own main sites running IPv6. This entry was posted on December 19, 2011, 11:00 am and is filed under best practice, IPv6, the business of system administration. You can follow any responses to this entry through RSS 2.0. Both comments and pings are currently closed. You may want to double-check your resolverーclients1.google.com and plus.google.com have AAAAs. I suspect that this was related to some DNS caching that was going on; I hadn’t had an IPv6 resolver in place for very long when I took these screenshots. I’ll triple check when I get home.